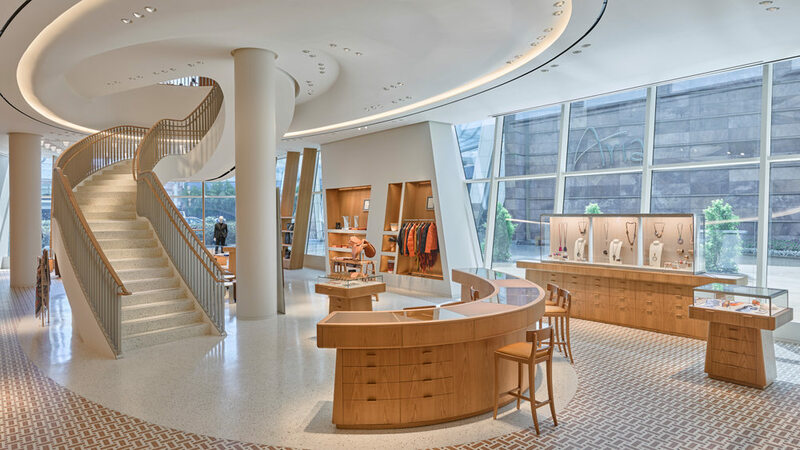 Hermès has opened a new 13,000-square-foot boutique in Las Vegas, complete with the first VIP salon location for US consumers to have a completely private luxury shopping experience. The large boutique was designed by Parisian architecture firm RDAI and offers a full range of Hermès' lines including womenswear, saddlery, home, and leather goods. Customers are greeted by a large area dedicated to scarfs, a nod to the house's best-selling item. [post_ads]Hermès USA president and CEO Robert Chavez told Yahoo that the space at the Shops at Crystals formerly housed a nightclub and was dark, "But we saw the potential to turn it into a place where we can welcome top clients into the world of Hermès.” The store is three times as large as the old Crystals Hermès store. Products have been curated especially for the Las Vegas market. One-of-a-kind calfskin boxing gloves, paying tribute to Las Vegas' boxing market, and leather dice keychains are part of the assortment. Chavez also pointed out the brand's expanded home selection, stating, "We can do a table setting, we can do a living room setting, we can do an office setting. This category is in-demand in the Las Vegas market." The space also houses the first VIP salon concept for the US market, a space designed for extremely high-end goods to be shopped in total privacy. Chavez says of the VIP area, "We did it because we do have a lot of high rollers and we want to be able to cater to them and pamper them." VIP items include a diamond Birkin bag and a pavé-diamond collier de chien bracelet. Chavez said the Las Vegas VIP location will be the first in a series of lounges rolled out for VIP consumers across the US. Hermès' new Las Vegas boutique and VIP lounge is now open at the Shops at Crystals.